Yet another wildflower favorite and must have for the garden is the Tradescantia (Spiderwort) plant. These interesting flowers not only offer something different to the landscape but are extremely easy to grow and care for. So how did such a lovely plant get such an unusual common name? While no one may know for certain, some people think the plant was named for the way its flowers hang down like spiders. Others believe it comes from its medicinal properties, as it was once used to treat spider bites. At any rate, it’s well worth having in the garden. The three-petaled Tradescantia flowers are usually blue to purple, but may also be pink, white or red. They only remain open for a day (blooming in morning hours and closing at night), but the multiple flowers will continually bloom for up to four to six weeks in summer. The plant’s foliage consists of arching grass-like leaves that will grow about a foot or two in height, depending on the variety. Since Tradescantia plants grow in clumps, they’re great for use in borders, edging, woodland gardens and even containers. You can even grow it as an indoor plant if garden space is limited. Growing Tradescantias is easy and you will find the plants to be quite resilient. They typically grow in moist, well-drained and acidic (pH 5 to 6) soil, though I have found the plants to be quite forgiving in the garden and tolerant of many soil conditions. Tradescantia plants do best in partial shade but will do equally well in sunny areas as long as the soil is kept moist. 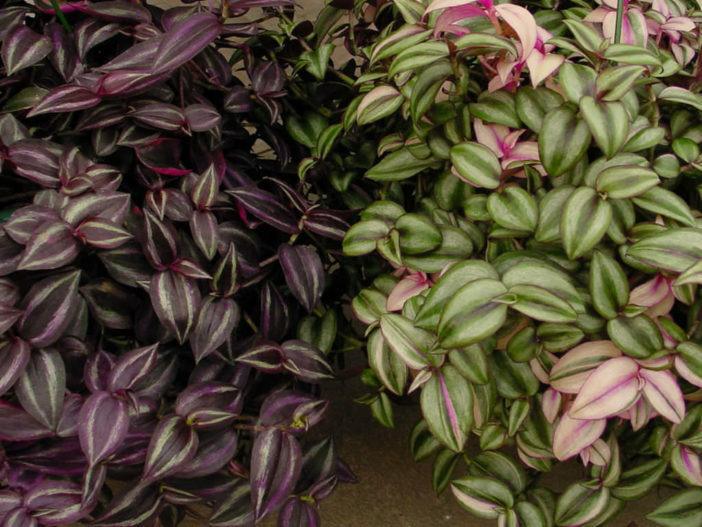 Tradescantia can be grown from purchased plants or propagated through division, cuttings or seed. Plant them in spring about 4 to 6 inches (10 to 15 cm) deep and 8 to 12 inches (20 to 30 cm) apart. Stem cuttings in summer or fall will easily root in soil. Seeds can be sown outdoors in either fall or early spring and should be lightly covered. If starting Tradescantia seeds indoors, do so about eight weeks prior to transplanting outside. It should take anywhere from 10 days to six weeks for germination to occur. Hardened seedlings can be transplanted outdoors about a week after the last spring frost. Allow it to spend warm spring and summers days outdoors, if feasible. During its active growth, water moderately and apply a balanced liquid fertilizer every four weeks. Water sparingly in winter. These plants like to be kept fairly moist, so water regularly, especially if you’re growing them in containers. Cutting the plants back once flowering has ceased can often promote a second bloom and will help prevent re-seeding. Cut the stems back about 8 to 12 inches (20 to 30 cm) from the ground. Since Tradescantia is a vigorous grower, it’s probably a good idea to divide the plants in spring every three years or so.